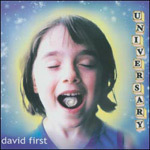 The last time David First released a recording in the pop/rock vein he influenced a generation's music. In a recent issue of Mojo, Sonic Youth's Thurston Moore mentions a 45rpm, The Zipper, by First's punk era band, The Notekillers, as one of the songs he gave to the other members of the band when they were starting out and called it a "mind blowing instrumental single." First, a pivitol figures in the swirling world of "downtown experimental" music, has been called "a bizarre combination of Hendrix and LaMonte Young" (Village Voice), "the next big thing in guitar gods" (Time Out NY), and "a fascinating artist with a singular technique" (The New York Times).